77,000 operating rooms worldwide without a single pulse oximeter is an enormous statistic, but it’s still not large enough to fit all the faces – children, parents, families – at risk from unsafe surgery. So at Lifebox it’s a privilege to hear first hand accounts from providers who meet this number, faces first, every day. Benson Nfon Tanjong is an anaesthesia provider in the Northwest Region of Cameroon. He’s president of the Cameroon North Westerner’s Association of Anesthetics, and a driving force for safer anaesthesia in his country. 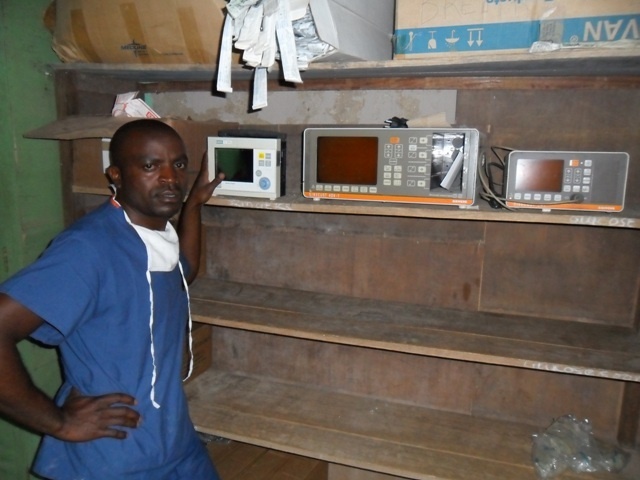 That’s him above, with some old monitoring machines at his hospital – they haven’t worked in some time. “Health care delivery in the developing world is still overwhelmed with so much poverty. Patients come to the hospital almost at the terminal stage of their illness, after visiting many traditional healers. Still, on a yearly basis we operate about 1200 cases. We have two operating theatres with four beds, and a very simple Boyles anaesthetic machine with no ventilator attached. We have one pulse oximeter, which we agree to use on the most serious patient of the day. We have one functioning monitor that constantly goes off, following regular power shortages. In my practice I have experienced serious negative effects from the absence of a pulse oximeter. Four months ago I was called for an emergency cesarean hysterectomy for a 31-year-old woman whose placenta had ruptured overnight. We realized that the baby had died in utero – probably of severe hypoxia. The maternity ward in our hospital is a pretty busy one, but with no equipment to help in resuscitation of either babies or the mothers. After the hysterectomy, the lady was not recovering from the anaesthesia. I ordered a blood gas analysis, and the results were more or less those of a living corpse. In about an hour the patient arrested and died. This is life experience. This woman needed a pulse oximeter early on, so that changes in saturation could be diagnosed earlier, and proper measures taken.